With our vast experience, we are prepared to guide you through the complicated litigation process as comfortably as possible. No two lawsuits are the same, which is why the Denton Peterson approach to litigation is designed to be flexible to your goals and budget. Sometimes cases demand that we explore every tiny detail, but sometimes a less rigorous review of certain, critical components is sufficient. In that case, we take the time early in our relationship to sift through the complex issues, and to uncover and explore only the ones that matter most. Once we have evaluated your case, we tailor our approach to best suit your needs and your budget. No two lawsuits are the same, but all are deserving of the same careful attention to detail which we give to each of our cases. The best litigators are the ones who have the experience and the wisdom to recognize when litigation is not the best course of action, either because of the specific facts of the case or because a trial would be prohibitively expensive or lengthy. If a problem exists that can be solved without incurring significant litigation costs, we can build a mediation or arbitration strategy that works for you. The Denton Peterson attorneys understand how important effective communication between attorney and client is to successful litigation. This is why we strive to build a relationship and maintain an open line of communication with each of our clients. As a result, our clients are comfortable knowing exactly where they stand at all times in the litigation process. Our attorneys and paralegals are readily accessible to answer your questions and address your concerns at any point during the litigation. We promise that our attorneys will be prepared for every stage of the litigation, and we work hard to make sure our clients are prepared as well. Our Arizona business attorneys will walk you through all your options and the potential risks of each so that, together, we can make the best decisions for you and your case. Our clients can be confident that we will advocate fiercely and responsibly on their behalf. When you become a Denton Peterson client, your goals become our goals, and we will deploy all appropriate legal strategies to see them accomplished. We are confident that you will be proud to call the litigation team at Denton Peterson YOUR litigation team. Brad Denton represented a defendant who was sued in case where the plaintiff alleged that our client had promised to lease a particular piece of property for a medical marijuana dispensary. At the end of the case, the plaintiff who sued our client got nothing, and had to pay all our clients’ attorneys’ fees—plus about $20,000! Brad Denton and Larry Dunn obtained a temporary restraining order tying up millions of dollars in real estate proceeds. Our client, a real estate investor, had made large investments in a partnership, only to have his partner misappropriate huge amounts of that money. In a two-week jury trial, Brad Denton represented a supplier with operations in North America and Europe who was being sued by a distributor. After extensive litigation, the case settled on very favorable terms while the appeal was pending. Sterling Peterson obtained a temporary restraining order on behalf of our client, a small insurance agency. A competitor was vandalizing company property and lying to customers—until we obtained a court order to make him stop. Brad Denton and Larry Dunn represented a music licensing business in federal litigation against a competitor who was violating copyright law and lying about our client’s business practices. After extensive litigation in various states, the other party agreed to close down the offending parts of her business, post a public apology on her website, and pay a substantial portion of our attorneys’ fees. Larry Dunn defended a trustee in a breach of fiduciary duty case where our client was accused of misappropriating funds from a minor’s trust. Brad Denton represented a non-profit company whose confidential records were being sought by the ex-spouse of one of the company directors. We convinced the court to structure disclosure to protect our donors and our financial information. Brad Denton represented a small business owner whose premises and inventory were destroyed in a fire caused by a neighbor. Brad Denton obtained a six-figure settlement for a small business owner who had been sold an inappropriate insurance policy. The insurance company was forced to pay back all the amounts our clients had paid for the policy, plus interest and attorneys’ fees. Our litigators fended off a threatened lawsuit by a former associate against a business broker who was our client. Brad Denton convinced an opposing party not to file a threatened six-figure lawsuit in a contract case regarding a diamond brokerage. 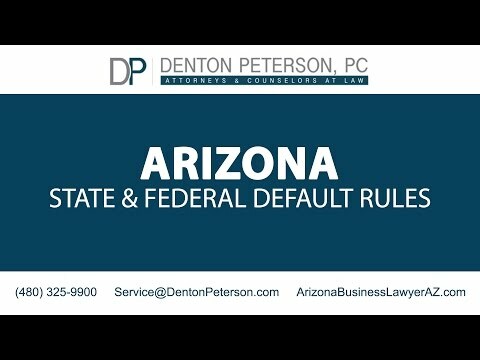 Brad Denton successfully obtained complete dismissal, based on lack of jurisdiction, of a lawsuit against our New York client who was sued in Arizona. Our litigation team is representing clients right now in many other similar cases. Brad Denton represented another lawyer in a defamation lawsuit. Brad Denton represented a group of Arizona constables, who sued after a new regulation was put in place about what weapons they could carry. Larry Dunn and Brad Denton represented a long-time client in a significant personal injury case involving a broken neck and other serious injuries. Sterling Peterson represented clients in medical malpractice cases. Brad Denton has represented charter schools in several cases involving disputes with students and teachers. After the death of his mother, our client was accused by his brother of abusing his mother while she was alive and taking millions of dollars in property from the estate. After extensive litigation and a five-day trial in California, Brad Denton led our client to a complete victory in the case and was awarded attorneys’ fees. Sterling Peterson represented a beneficiary of a trust in a case where the trustee had inappropriately frozen assets. After an evidentiary hearing, our client prevailed and the assets were freed. Sterling Peterson and Larry Dunn represented a trustee client in a matter brought by a large financial institution alleging financial improprieties. We were successful in getting the case against our client dismissed. Sterling Peterson and Larry Dunn obtained special action relief on behalf of an out-of-state client. After the trial court ruled that our client must stand trial in Arizona, we convinced the Court of Appeals to overturn that ruling. Brad Denton obtained a favorable ruling in a case defining homeowners’ obligations to maintain the sidewalk adjoining their property. Brad Denton obtained a very favorable settlement for a client in the Court of Appeals during a settlement conference leading up to an appeal of a two-week trial. Our lawyers have represented other appeal cases brought to us after adverse trial rulings.